Emirates Engineering Maintenance Company .. with a Kingspan envelope system. Kingspan Insulated Panels, a global leader in high-performance building envelope technologies, is carrying out an extensive expansion of its manufacturing plant in Dubai. The new facility will produce Kingspan’s latest optimised building solutions and serve as a regional hub to meet the rapidly growing demand for energy-efficient buildings in the GCC, and East and South Africa. Central to the upgrade is the addition of a new production line for IPN QuadCore, Kingspan’s game-changing hybrid insulation core. Engineered with phenolic chemistry, IPN QuadCore sets new thermal, fire, environmental and guarantee standards for insulated panels. “This investment marks another milestone in Kingspan’s commitment to serve our customers across the globe and bring them the most advanced building technologies available,” said Gilbert McCarthy, managing director, Kingspan Insulated Panels. 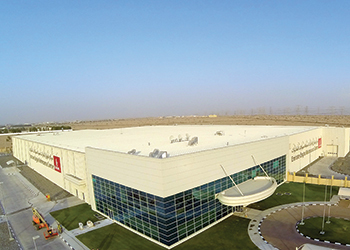 The £10-million ($15.69 million) investment will see the current plant in Dubai Industrial Park expand to 7,000 sq m.
In addition to the new production line for architectural wall and roof panels, the improved facility will include an extension to the current manufacturing plant, which will feature the Kingspan energy cost-saving rooftop solar PV (photovoltaic) system. Its envelope systems, which include Kingspan insulated roof and wall panels, standing seam systems and benchmark architectural façades, are combined with integrated energy solutions, like the Kingspan Photovoltaic and ZerO Energy lighting systems, to deliver buildings that generate their own energy and optimise performance thereby minimising energy consumption and costs.